O Canada Comes to KYC! KINGSTON, ON — 13 August 2015 O Canada, an extreme offshore racing yacht, has arrived in Kingston and is open to the public this entire weekend. The Canadian Ocean Racing team has sailed from Vancouver via the Panama Canal, Halifax to Toronto sharing this one-of-a-kind racing machine with sailing enthusiasts across Canada, and now she is here. While O Canada will next year take one man on a solo race around the world, Skipper,Eric Holden, needs to build a massive team to support his epic journey. 10 AM - 5 PM August 14-16. All are welcomed onboard O Canada to meet Skipper Eric Holden, 2014 Rolex Sailor of the Year and explore the boat that will take him around the world. On Saturday, August 15, Eric Holden and members of his crew will be testing their sailing skills in some dinghy match racing starting at 2:30 PM. Come watch the competition between Skipper and crew as they compete in dinghies with lucky members of the audience. There will be raffle ticket drawings at 5 PM to win a sunset sail onboard O Canada and Helly Hansen team gear. There are also opportunities to charter O Canada for private sails August 14-18 or even come onboard as crew for an authentic overnight passage from Kingston to Toronto August 19. Canadian Ocean Racing on www.windathletes.ca/donate. 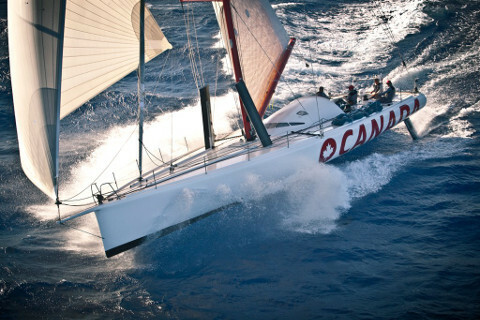 Follow the team’s journey on www.canadianoceanracing.com, on Facebook or Twitter and Instagram @oceanracers. Chef Neil's Jerk Chicken with a sweet cilantro pressed yoghurt. Grilled hot italian sausage with house-made sauerkraut. Our feature beer this week is from Broadhead Brewing in Ottawa and is their Wildcard Pale Ale, a mildy hopped pale hale. Broadhead's Darkhorse Stout, will be replacing the Wind & Sail Dark Ale. Come in and try a pint and as always let us know what you think! 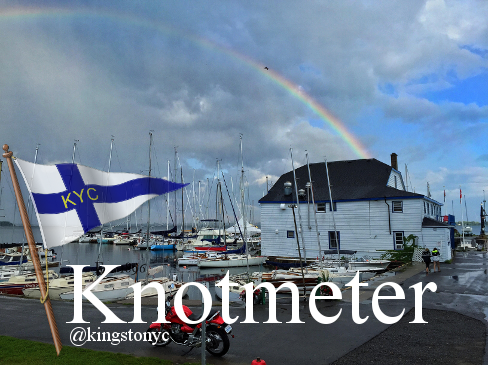 Saturday, August 29th at Jemmet's landing, KYC will be hosting our long-awaited summer wine-dinner. Chef Neil will be creating a delicious menu of local food to be paired with some of the best wines Ontario has to offer. There are only 20 seats for this exclusive farm to table event, sign up with James at bar@kingstonyachtclub.ca today, to avoid disappointment! Under normal circumstances, and as a general rule, each Race Committee should make their very best effort to be on the course and prepared to start races on time. There are a couple of exceptions: clear and present/impending danger (e.g. lightning, extreme wind/squalls) or no prospect of sufficient wind to start a race. In the case of the former, safety for the racers is the overriding consideration. In the case of the latter, it's a practical consideration for racers (i.e. not having to rig their boats, go out to the course, return the the club, un-rig, etc, unnecessarily). An on shore abandonment recently occurred for safety reasons. The majority of racers thought the overall process (on shore consultation by the RC with a large number of skippers from each fleet) worked well and the decision to abandon correct.